For a story to be true, it needs folks who believe. Folks who know the strangest things are often the most real. So settle your bones and grow quiet as you can. You’ll want to listen close. This is the whole story as was first told by someone who had been there. Someone who had seen them with his own two eyes . . . 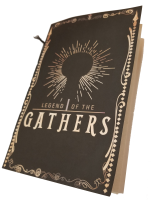 The special chapbook The Legend of the Gathers: Protectors of the Light tells the story of that day in 1880 and of the mysterious boy who forever changed the fate of one small town. Legend has it, that boy was one of The Gathers, phantom folk who appear each year during The Days of Incandescence to help get the light out into the world. A free public reading of The Legend of the Gathers chapbook will take place in Centerway Square on Halloween following Trick-or-Treat and the judged costume contest. If you’re interested in reading the whole story for yourself, the chapbook will be sold at various retail locations throughout Corning. A Cooperative Event Partnership between the Steuben County CVB, Corning's Gaffer District, the Gaffer District Business Association, and Urban Corning.